Is it a Mental Illness or a Mental Disorder? A few months ago, someone told me that autism was not a mental illness and that when people call it that, they are wrong. Today someone challenged me again that autism is not a mental illness, but a mental disorder. Is having a mental illness such a bad thing? I have bipolar disorder and it definitely is not something I would wish on anyone. However, I believe that mental illness is considered such an awful thing because of the stigma and because people are just not educated about it. I have a problem with the two people who were so adamant about autism not being a mental illness. I knew it was in the DSM 5 (Diagnostic and Statistical Manual of Mental Disorders), but I did some more digging. I thought that maybe mental disorder was not the same as mental illness. Well, I found out from several sources, that it is. Psych Central has autism listed under “Symptoms and Treatments of Mental Disorders.” I have already determined that the term mental disorder is synonymous with mental illness. National Institute of Health: There are many different MENTAL ILLNESSES, including depression, schizophrenia, attention deficit hyperactivity disorder, AUTISM, and obsessive-compulsive disorder. Each illness alters a person’s thoughts, feelings, and/or behaviors in distinct ways. Friends of Mental Health/Advocacy: There are many different MENTAL ILLNESSES, including depression, schizophrenia, attention deficit hyperactivity disorder (ADHD), autism, and obsessive-compulsive disorder. Each illness alters a person’s thoughts, feelings, and/or behaviors in distinct ways. Mental illness, mental disorder, developmental disorder. As a parent, what term would you rather have your child called? Think about it- How much of your answer is determined by stigma and society? To put it more harshly, If someone does not think or want autism to be called a “mental illness”, I suggest they call Wikipedia, Merriam Webster, the authors of the DSM 5, NAMI, Psych Central, The Brain & Behavior Research Foundation, and NAMI to argue their point. Maybe instead, they could help erase the reason why they feel it should be called a mental illness or mental disorder. It is not that autism is or isn’t a mental illness or mental disorder that bothers me. What bothers me is that people think it is so awful that their loved one is labeled as having a mental disorder or mental illness. Note: There were a few places I did not see autism listed as a mental disorder or mental illness. Some say that it is a developmental disorder. However, I found autism listed as a mental disorder of mental illness in the majority of the places I looked. 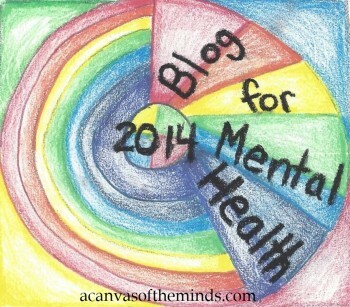 This entry was posted in Uncategorized and tagged Autism, bipolar, dsmV, MEntal, mental disorder, mental illness. Bookmark the permalink. 4 Responses to Is it a Mental Illness or a Mental Disorder? I agree with you. I don’t think it should matter, the thing that matters is helping people. Probably people see it as different because of the signs. I mean, I know people with autism and other mental illnesses and the way people with each are treated is very different. People with things like depression or borderline personality disorder or bipolar are told that they can take control and think their way out of their feelings. People who have autism are more accepted as not having control over it. Having a mental illness myself, I recognize the prejudice in telling us that we have control (or don’t have it). I don’t know how to fix myself or the stigma, but that doesn’t mean I’m not trying. autism is just excess of testosterone in the body. 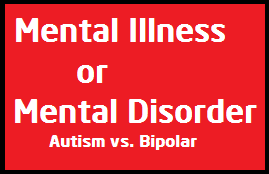 Bipolar Disorder is a chemical imbalance in the brain.